"The Department of Justice has determined that the district court's judgment should be affirmed," three department lawyers wrote in a letter submitted Monday to the U.S. Court of Appeals for the Fifth Circuit, which is now considering the case. "Because the United States is not urging that any portion of the district court's judgment be reversed, the government intends to file a brief on the appellees' schedule." "The Republican party will soon be known as the party of health care," Trump predicted. "You watch." When asked for comment on the legal filing, Justice Department spokeswoman Kerri Kupec told ABC News, "The Department of Justice has determined that the district court's comprehensive opinion came to the correct conclusion and will support it on appeal." "The Trump administration decided not only to try to destroy protections for Americans living with pre-existing conditions but to declare all-out war on the health care of the American people," Pelosi said in a statement Monday night. "Democrats will continue to fight relentlessly to protect people with pre-existing conditions and to deliver lower health costs and prescription drug prices for every American." "The GOP will never stop trying to destroy the affordable health care of America's families," Pelosi, D-Calif., said. "In this House, with a Democratic majority, we're here to strengthen those protections and to lower healthcare costs." 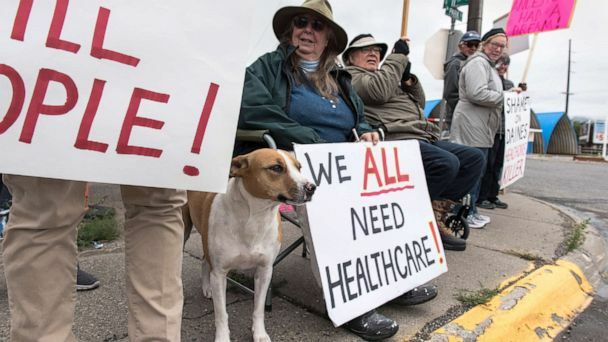 "Once the heart of the ACA -- the individual mandate -- is declared unconstitutional, the remainder of the ACA must also fall," according to the lawsuit.